When Secretary of State Lawson was a member of the Indiana Senate, she supported voter ID and restrictive laws to combat non-existent voter fraud. 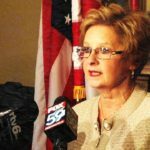 Earlier this year, Secretary Lawson initiated a voter purge removing more than 481,000 voters from the rolls, which equals almost 10 percent of the voters in Indiana. Lawson is a member of President Trump’s so-called election integrity commission, and is a supporter of Kansas Secretary of State Kris Kobach and his voter suppression policies.